Come explore The Digital Dominion! So many of Virginia’s most amazing man-made landmarks are powered by computer science (CS), and many are places worth knowing about and worth visiting. 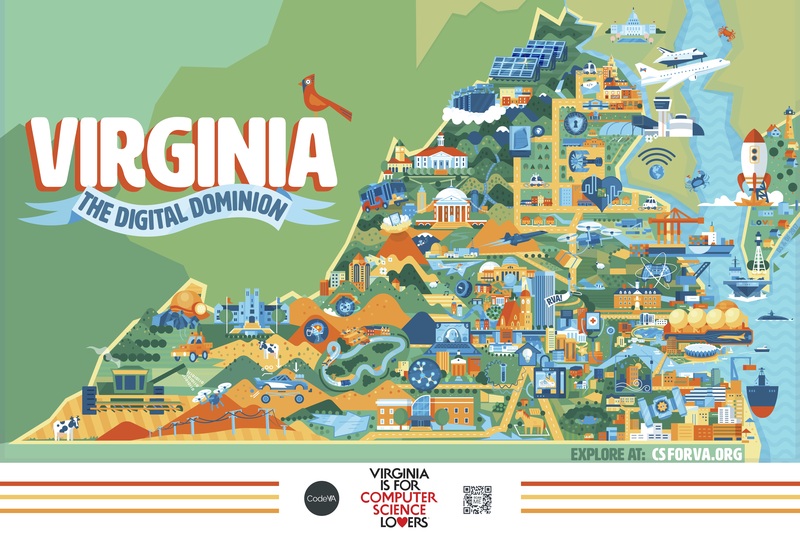 The Digital Dominion map is part of a partnership between CodeVA and Virginia Tourism Corporation highlighting tech tourism around the state to bring people of all ages in touch with computer science. The map also provides a fun and entertaining learning opportunities for parents and teachers to explore with their students. So much of Virginia’s history is tied to pioneering human advancement. This pioneering spirit has continued in the Digital Age powered by Computer Science. So much of our future will also be driven by even greater advances by Virginians in this field. From NASA Langley, which was featured in the story of Hidden Figures; to our amazing museums like the Science Museum of Virginia, Nauticus, the Steven F. Udvar-Hazy Center; to Ashburn, Virginia, through which more than 70 percent of the world’s internet traffic travels; to the Northern Virginia and Southside Virginia test roads used to develop tomorrow’s autonomous vehicles; Virginia is the Digital Dominion.